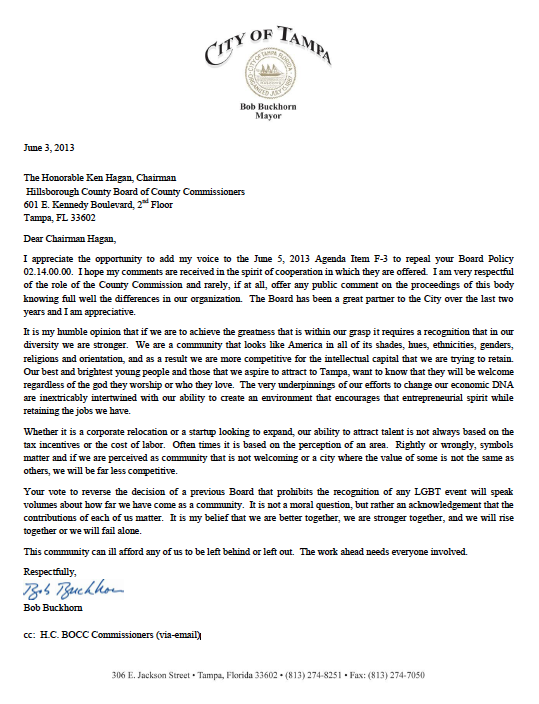 I appreciate the opportunity to add my voice to the June 5, 2013 Agenda Item F-3 to repeal your Board Policy 02.14.00.00. I hope my comments are received in the spirit of cooperation in which they are offered. I am very respectful of the role of the County Commission and rarely, if at all, offer any public comment on the proceedings of this body knowing full well the differences in our organization. The Board has been a great partner to the City over the last two years and I am appreciative. It is my humble opinion that if we are to achieve the greatness that is within our grasp it requires a recognition that in our diversity we are stronger. We are a community that looks like America in all of its shades, hues, ethnicities, genders, religions and orientation, and as a result we are more competitive for the intellectual capital that we are trying to retain. Our best and brightest young people and those that we aspire to attract to Tampa, want to know that they will be welcome regardless of the god they worship or who they love. The very underpinnings of our efforts to change our economic DNA are inextricably intertwined with our ability to create an environment that encourages that entrepreneurial spirit while retaining the jobs we have. Whether it is a corporate relocation or a startup looking to expand, our ability to attract talent is not always based on the tax incentives or the cost of labor. Often times it is based on the perception of an area. Rightly or wrongly, symbols matter and if we are perceived as community that is not welcoming or a city where the value of some is not the same as others, we will be far less competitive. Your vote to reverse the decision of a previous Board that prohibits the recognition of any LGBT event will speak volumes about how far we have come as a community. It is not a moral question, but rather an acknowledgement that the contributions of each of us matter. It is my belief that we are better together, we are stronger together, and we will rise together or we will fail alone. This community can ill afford any of us to be left behind or left out. The work ahead needs everyone involved.